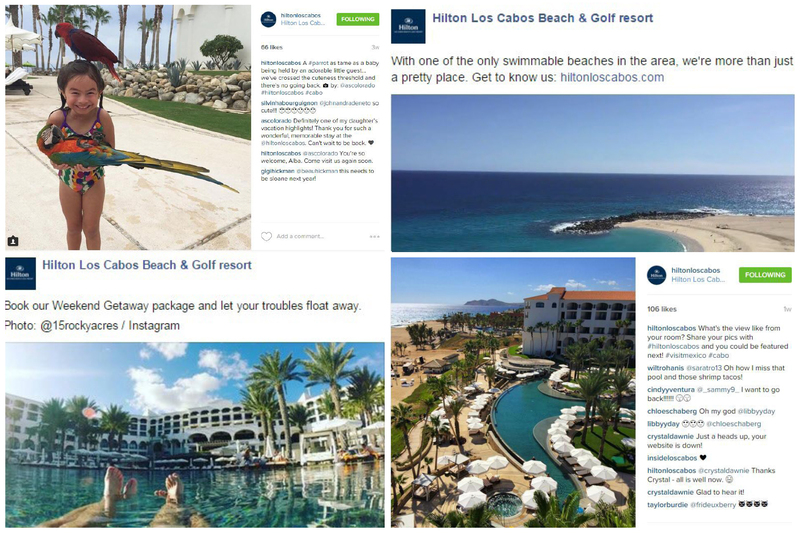 The Hilton Los Cabos Beach & Golf Resort (HLC) needed to define and promote its Exceptional Returns communications strategy on social media in a way that would outshine competitors along the Los Cabos, Mexico tourism corridor. Our guest-driven strategy breathed new life into HLC’s social media channels, resulting in a 48% increase in organic Facebook reach and 53% increase in branded hashtag use over a one-year period. In 2014, Hurricane Odile caused extensive damage to Hilton Los Cabos Beach & Golf Resort (HLC). T4G was selected to help the hotel rebuild its social media presence after a year-long hiatus. We hosted a brand voice workshop, designed a content strategy and workflow procedures, interacted with followers on HLC’s behalf, and reported and optimized based on results. HLC had been silent on social media during its period of rebuilding and renovating and had therefore lost social media momentum (including followers, reach, impressions, and engagement, to name a few). Many luxury resorts along the same corridor were in the same predicament and competing for social media attention from the same audience – HLC needed to stand apart from the crowd.